FTA HD ISDB-T Digital Terrestrial Convertor TV BOX Receiver PVR 5dBi Antenna. 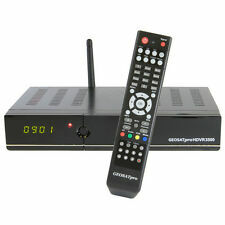 1080P HD Digital MPEG4 DVB-T2 Receiver tv tuner iptv Receptor Convertor Youtube. (You can update your iptv m3u channel list on our receiver). 1.1080P Full HD DVB-S2 2.Support Full PowerVu, DRE &Biss key 3.Support Unicable 4.Support XML EPG 5.Support Multi-CAS, USB wifi, Ethernet,Full speed 3G usb dongle,GPRS dongle, PVR Ready 6.Support WEB TV,Youtube,Youporn,Redtube 7. Support Clines. JyazBox V500 on the screen;. and full cool for the jb200;. 6,Jb200 improved again, supporting multi-. 2, 2usb ,wifi, 1080p etc. supporting ;. 4, Fan is with sv8000hd ’ fan,low noise. (3) WIFI USB antenna. No need for awired internet connection. cualquier duda hablamos espanol. Features: Software features: Fully comply with DVB-S/S2, MPEG-2/4 H.264 Standard. Supports single / multiple or blind search satellite search. Automatic PAL/NTSC conversion. Support DiSEqC 1.0 / 1.1 / 1.2/1.3 (USALS) protocol. Various channel editing function (favorite, move, lock, skip, delete, rename, find, sort). Support BISS KEY. Support teletext/subtitle/multi-language. The receiver Support IPTV Function. but without one year iptv Channel server. (You can update your iptv m3u channel list on our receiver). 1 USB Wifi Antenna. Support Dolby AC3 audio decoder,You can Get All HD/SD Clear or encryption Channel with HD Dolby AC3 Audio. (DVB S2 demodulator. DiSEqC1.0/1.1/unicable/1.2/1.3(USALS) supported) NIT search supported;. Support MPEG-5;. Support HDMI 1.3;. Selectable High light LED Display. NEW JYAZBOX ULTRA HD V500. (1PC ) JYAZBOX HD v500 LATEST MODEL. JyazBox Ultra HD V500 features 4, Fan is with sv8000hd’ fan, low noise and provide more air for the jb200. 6, JB200 improved RED perfectly now;. DVB OPENBOX V8S Digital Satellite Receiver -Brand: DMYCo -Support: /Newcamd/MGCamd/AvatarCam/GS Camd/X Camd/Red -Support 1: Youporn, Weather Forecast -Type: Digital TV Satellite Receivers Openbox Decoder -Support 2: 2x USB, USB Wifi, 3G modem(not build in) -Item: TV Satellite Receivers/Decoder -Support 3: WEB TV, Biss Key, DLNA -Model number: Openbox V8S -CPU: Dual-Core -Memory: DDR III 256M, ROM 400M, Serial Flash 8M -Multiple display mode: 1080p/1080i/720p/570p/576i/480p; - Ali3511 Solution - Dual-Core CPU, 600MHz MIPS Processor - DDR III 256M, ROM 400M, Serial Flash 8M - Support WEB TV, Biss Key, DLNA - Support 2x USB, USB Wifi, 3G modem(not build in) - Support Youporn, Weather Forecast -MPEG-2 / H.264 Hardware decoding. Full HD 1080P. 1 FREE PIECE USB WIFI WITH EVERY RECEIVER. 3000 LIVE TV & 2000 VOD(MOVIES). 2 YEARS DRAGON (LIVE TV KIDS MOVIES SHOWS). 1 YEAR GOLDEN (LIVE TV MOVIES KIDS SHAHED). 1 YEAR DREAM(LIVE TV KIDS MOVIES SHOWS). Videotext Decoder. 10/100Mbit Ethernet Interface. MPEG-2 MP@HL & MP@ML;MPEG-1 Layer I & II & III, Digital Audio(AC3);. Support WEB TV. High light LED Display. Support HDMI 1.3;. Features - Ali3511 Solution - Dual-Core CPU, 600MHz MIPS Processor - DDR III 256M, ROM 400M, Serial Flash 8M - Support WEB TV, Biss Key, DLNA - Support 2x USB, USB Wifi, 3G modem(not build in) - Support Youporn, Weather Forecast - Support /Newcamd/MGCamd/AvatarCam/GS Camd/X Camd/RedCam multiple LNB-Switching control (supports DiSEqC1.0/1.1/unicable/1.2/1.3(USALS) supported) NIT search supported; Support MPEG-5; Support HDMI 1.3; Support PVR(store in USB disk); Multimedia files playback(by USB); Support Electronic Program Guide(EPG) for 7 days; Teletext and subtitle out through OSD; Support multi-lingual DVB subtitle and teletext; Automatic and manual channel scan options; automatic service scan channel-change time < 1 second OSD in many languages and skin-support. Videotext Decoder. 10/100Mbit Ethernet Interface. MPEG-2 MP@HL & MP@ML;MPEG-1 Layer I & II & III, Digital Audio(AC3);. T95MAX Smart TV BOX 4GB 64GB S905W Quad Core Android 9.0 2.4GHz WiFi 6K G7M8Y US. - Ali3511 Solution - Dual-Core CPU, 600MHz MIPS Processor - DDR III 256M, ROM 400M, Serial Flash 8M - Support WEB TV, Biss Key, DLNA - Support 2x USB, USB Wifi, 3G modem(not build in) - Support Youporn, Weather Forecast - Support /Newcamd/MGCamd/AvatarCam/GS Camd/X Camd/RedCam Fully compliant MPEG-4 H.264/AVC Main Profile Level 3 & High Profile Level 4.1; MPEG-2 MPHL & MPML;MPEG-1 Layer I & II & III, Digital Audio(AC3); SCPC & MCPC receivable from C/Ku band satellites; multiple LNB-Switching control (supports DiSEqC1.0/1.1/unicable/1.2/1.3(USALS) supported) NIT search supported; Support MPEG-5; Support HDMI 1.3; Support PVR(store in USB disk); Multimedia files playback(by USB); Support Electronic Program Guide(EPG) for 7 days; Teletext and subtitle out through OSD.